The security of your website should be among your first priorities. You don’t want to waste all the hard work you put into your online business and have it hacked, for example. This is even more a necessity if your income comes from working online. – have a periodic backup (better if automatic – I do it three times, one on the server, one on my desktop computer, one on my 2 Tera external hard disk). 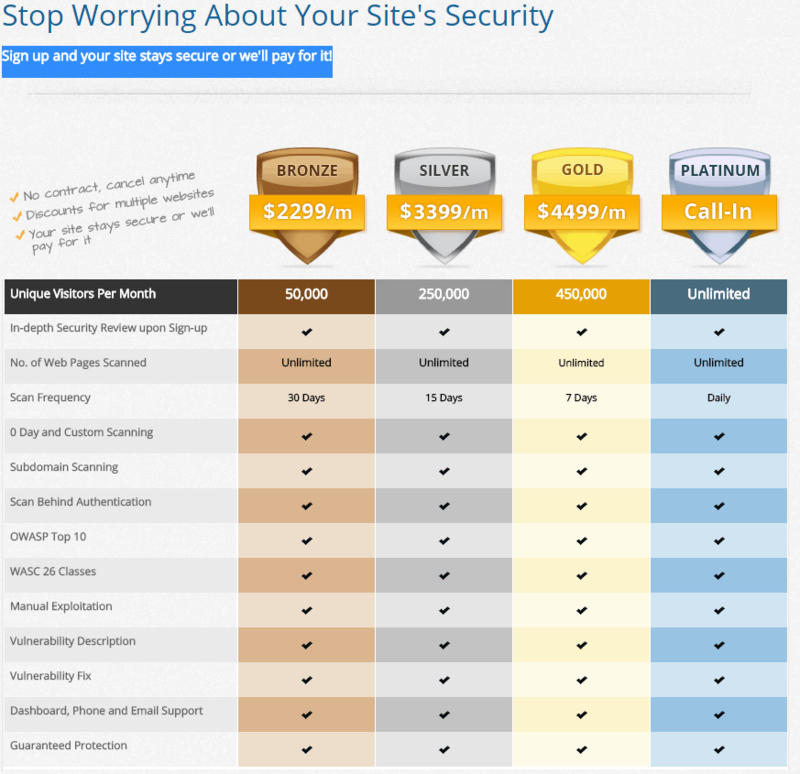 These are just some basic suggestions to help you secure your website. But if you want to sleep soundly and if your business justify the cost, then you should invest on a premium service. In this post, I want to introduce you Defencely, an online security firm founded in 2012. Defencely.com is focused on safeguard the vulnerability of your website, offering security solutions. The team runs a manual code review (most of the times the vulnerabilities come from problems with coding). Their main goal is to look for weaknesses in the security system in order to solve them before ill-intentioned begins any attack. While many companies in the same market use automated scanner tests, Defencely works with manual testing (many issues or vulnerabilities can be found just with manual testing, while are not detected if scanned by automated systems). False Positives are web scripts or other common problems, that may appear as a threat, but they are not. Have you ever run an antivirus software and got an alert of malware for files which actually were not an issue? That is an example of false positives. Defencely ensures to avoid any cost or time spent on this matter. Are you using WordPress? Or may be Joomla or Drupal? It’s common that any development team still leaves bugs in the code (it happened to me with Klinkk, created with Pligg CMS). Whether the content management system you have chosen, you are going to be secure from the first day. You’ll find everything you need in your dashboard. Each tool you have at your disposable serves for a specific reason. The reports you’ll get are not just a list of fixes, but reports with steps to take in order to improve the security of your website. If you are not a code expert (and if you have not a developer), the experts of Defencely will assist you during the solution of vulnerabilities. There is no limit to the number of page scan. Whether you have a small or huge online property, you are going to get the same service for all your properties. Defencely make use of OWASP Top 10 and WASC Classes 26 to secure your online assets. Any problem related to downtime due to attacks, viruses or malwares, can lead your business to lose money and online visibility. If you know nothing about vulnerabilities prevention, Defencely offers you simple and clear guides to solve the issue and take any measures so the problem won’t happen again. 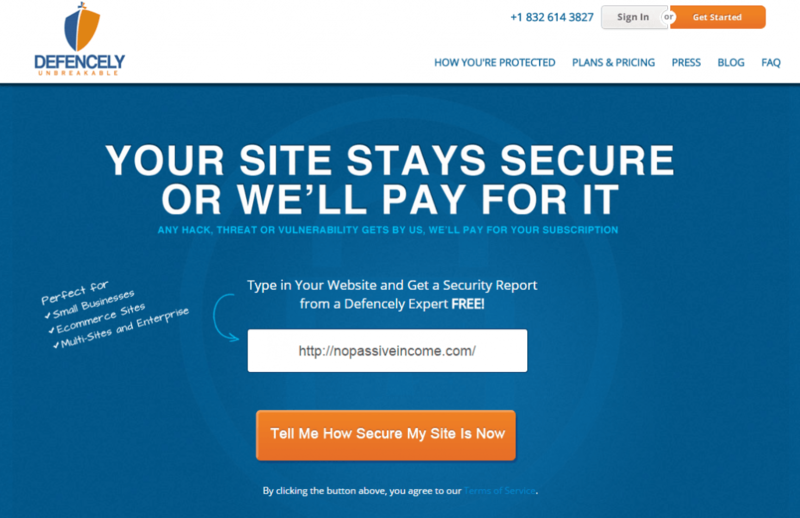 Sign up and your site stays secure or we’ll pay for it! Based in U.S., Defencely is growing very fast, having more than 1000 clients who are using their services. If your online business turnover permits it, then you should invest your money and get a premium security assistance. 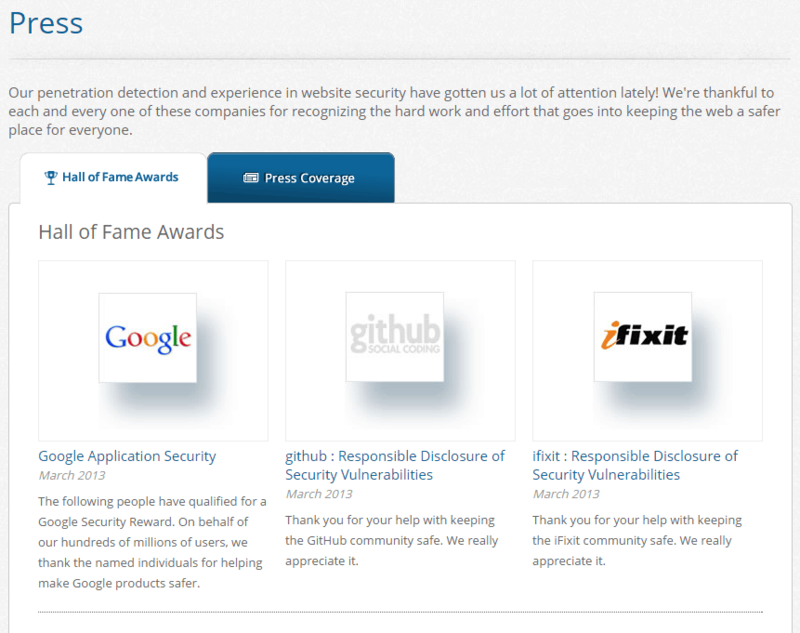 PayPal wall of fame page, Google application security, Zynga whitehats: they are all mentions to honorable job done by Defencely. As a reputable company, you don’t have to worry investing in their services. Which actions are you taking to secure your online properties? Defencly looks amazing and they have great services. Well there are several times when my blog got attacked by hackers and all I could do is just lost backup files. Trying defencly will surely help in getting every thing under check! Security is important for any online business owner. Thanks for checking and commenting, Christy. Aside the “professional look” of the website, we must consider its premium services, Gordan! And with its testimonials, I think it’s a SECURE company. Great article again as usual..Websites involve so much resources to come up with.Just a single aspect of not securing it may cause quite a hell of breakdown.This information is really important for our websites.Thank you again for your educating blogs. Good to hear that, Fakharuddin. Incredible article again as usual..Websites include such a great amount of assets to come up with.Just a solitary part of not securing it may bring about truly a hellfire of breakdown.This data is truly vital for our sites. A real investment of time and money. And they should be safeguarded. Thanks for commenting, have a good day. Its common for all platforms? WOW this feature is quite impressive as I have blogs is all major platforms and I guess its very beneficial to signup with it. Thanks for sharing your views, and let me know how it goes, if you are going to try their services. You always shared a unique idea here in this blog. I read your blog since 2013. It’s good to see all of your posts here in this blog. Yes, This post was also a good post. I will think about it for sure. I hope people will get help from this post. I appreciate for your kind words. Your feedback and support push me to work even harder, thanks! You’re always rocking, I loved reading this Security and Defense suggestions. Thanks for Sharing!! Back with bang post again! Plans or packages are very compelling and their features too. I think those who have a bunch of sites with good traffic must try out defencly. Simply amazing article. You have covered about website security in depth. Thanks for the kind comment, Basheer. Thanks Erik for sharing wonderful & informative review. Keep it up.